Sew to Celebrate Earth Day! Celebrate Earth Day this year by using your sewing skills to reuse, recycle, and repurpose. We’ve pulled together a sampling of our best projects that are repurposed or recycled, or that help you to recycle. There are projects for all sewers, no matter what your experience or skill level. So pick a project, get stitching, and help keep our world green! 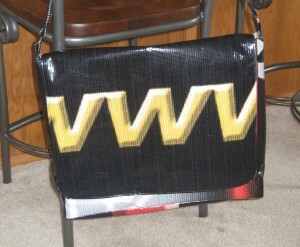 Stacy Schlyer’s Billboard Messenger Bag uses recycled billboard material and turns it into a bag roomy enough to hold all your stuff. 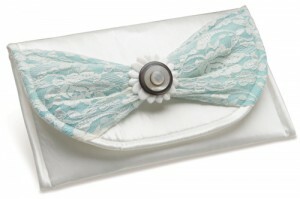 Repurpose an old special occasion dress to create Lisa Klingbeil’s classic Envelope Clutch. Jeanne Delpit shows us how she saves old buttons and turns them into Button Cuffs. This clever and simple project help you to recycle those plastic shopping bags in a handy fabric dispenser. Juliette Lanvers gives you all the instructions to make your very own Bag Boy. And speaking of shopping bags, why not stitch up a bunch of reusable bags to use instead of bringing home more plastic bags? 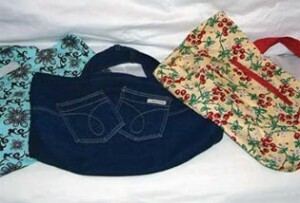 Stacy Shlyer shows you how to create Fabric Shopping Bags from recycled or new fabrics, just the right size for toting groceries. Next Next post: Go Team!